1996 sported 10 models, the most of any year to date. 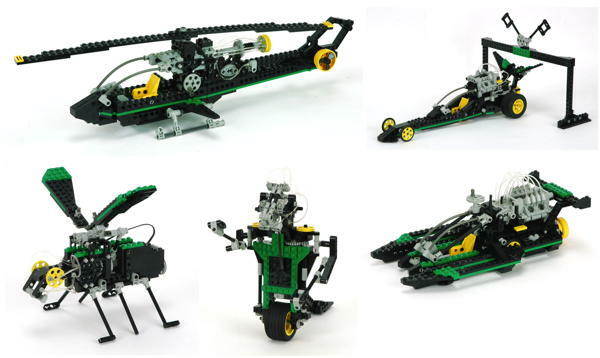 They were divided evenly with 5 simple Tech Play models for beginners, and 5 Tech Build models for more advanced builders. The sets ranged from very small (82 parts) to the largest set to date (1368 parts) and everything in between. Across the whole range of models, appearance was targeted more closely by the design, and most models used the semi-rigid hoses from the now defunct flex system as decorative elements to great effect. 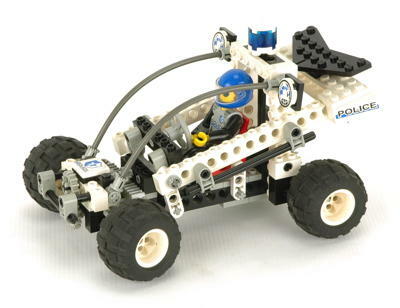 The Tech Play sets built on the theme of simple building with solid play features and Technic figures, but not surprisingly the 1996 models did not do anything very new or innovative. 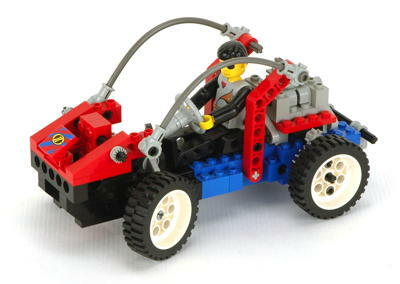 The Tech Build sets, on the other hand, had quite a bit to offer. 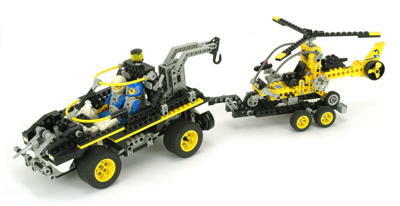 The pneumatic system made a comeback and the brand new fiber optic system was showcased in two models. You can read more about the fiber optic system below, but it can be summarized as innovative and short lived. The illuminated fiber optic elements offered simulated motion and were fun to watch. However, the element was doubtless very expensive to produce. My several copies all still work, but if any of the lights stop working it cannot be repaired. Perhaps it was for this reason that the system lasted only a single year and is a prized catch among collectors due to its rarity. Personally, I found it to be a great addition to the line, but I can understand why it wasn't usable across a wide range of models. There were only a few new parts in 1996 other than the fiber optic system, but all of them were a sign of things to come. The transmission gates and changeover catch signaled the use of more transmissions in the future, and the 6x4 bent liftarm and 3/4 pin continued to herald the onset of the studless system for those who were paying attention. 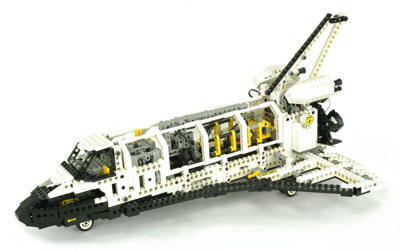 Every one of the new parts was used in the flagship set from 1996, the 8480 Space Shuttle. Every one of them was needed to make the shuttle work in the very special way that it does, and with the exception of the fiber optics, all of them were used for years to come. 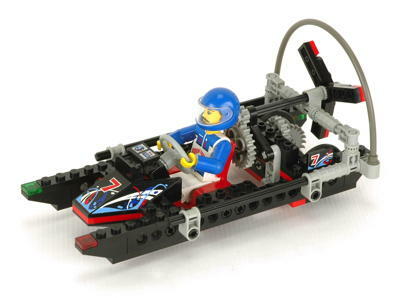 The fiber optic element was truly innovative, but sadly only appeared in 1996 in two sets and never again in Technic (and only in 2 other types of sets). This electric element is powered by a 9V wire and has 8 holes into which clear fiber optic cables fit. The far end of each cable fits in a pin hole. Each hole of the electric element has a red light (LED?) 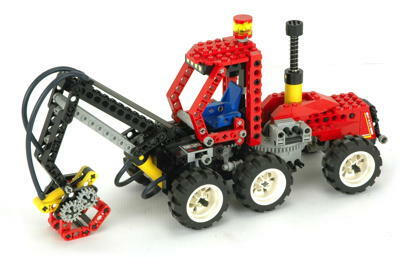 which illuminates only when the central axle is in a certain position, and only one at a time. To get the lights to move, the central axle must be turned by and external crank or motor, and then the fiber optic cables visibly light in sequence. While the 8880 had a unique transmission shifting lever, a more standardized solution was needed for other models. These gates (shown in gray) could be used in pairs along with the changeover catch above driving rings to allow shifting in an H-pattern. 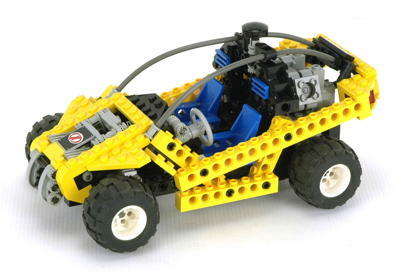 However, this system was somewhat limited to be used with only 4 gears. Besides the H-pattern on top, the gates also feature a transverse axle hole to support the catch. These parts were relatively rare and are no longer used. The changeover catch (shown in red) was designed to be used with the transmission gates and driving ring to shift gears in a transmission. Unlike the gate, it remains in use to this day, sometimes for purposes other than shifting a transmission. The axle hole in top and on the side can be useful, and the tiny hole in the tip will fit a flex cable. 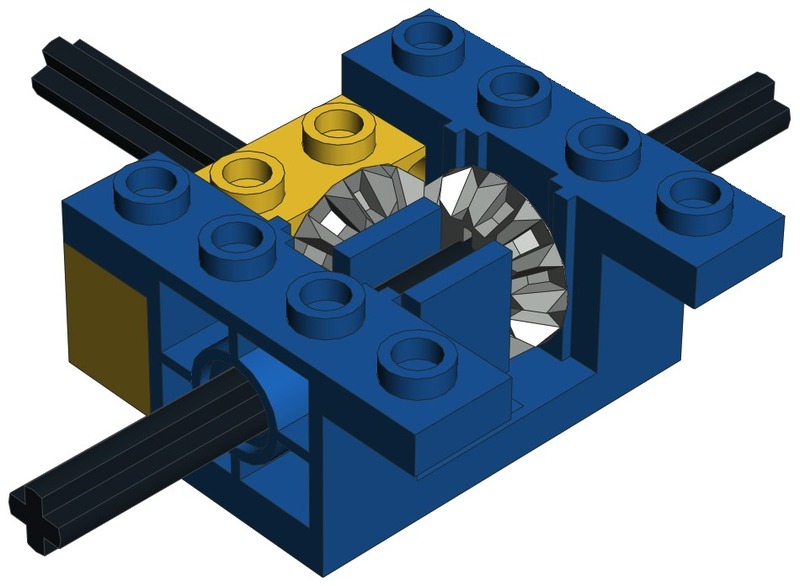 Like the 1x1 Technic brick introduced last year, the 1x2 with 2 holes is fundamentally different than the others because the holes are centered under the studs. This part was critical for the spacing of the gears in 8480. 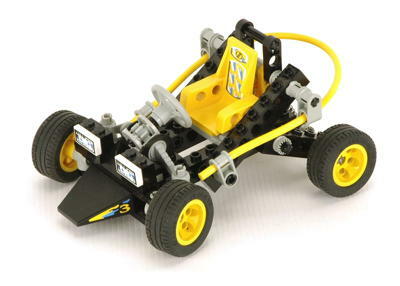 As Technic moved away from studded bricks and towards full thickness and half thickness liftarms, a pin which bridged the two was needed. The 3/4 pin is one stud long on one side but only half a stud long on the other and does not have friction. This part came only in dark gray until the next millennium. While a few half thickness studless liftarms had been introduced in previous years, this was the first full thickness liftarm. With 6 studs in one direction and 4 studs in the other, you might expect that this angled liftarm would be some obvious angle like 45 degrees or 30 degrees, but it is actually 53.13 degrees. Why? Because both ends need to fit on a standard grid of studs. With this angle, the axle hole at the end lines up perfectly with a square grid, but the other holes in between do not. This angle would be used for most bend liftarms in the future. 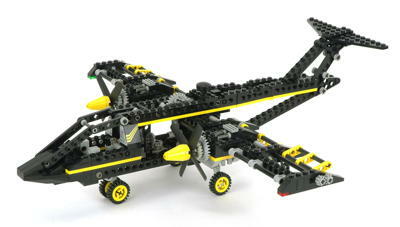 The particular part was critical to the payload bay doors on 8480.